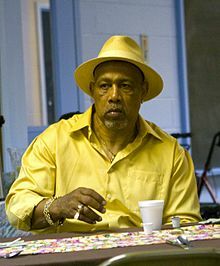 Kenneth Howard Norton Sr. (August 9, 1943 – September 18, 2013) was an American heavyweight boxer and WBC world Heavyweight Champion. He was best known for his 12-round victory over Muhammad Ali, when he famously broke Ali's jaw, on March 31, 1973, becoming only the second man to defeat a peak Ali as a professional (after Joe Frazier, who won a 15-round unanimous decision against Ali on March 8, 1971). Norton was born on August 9, 1943 in Jackson, Illinois. He studied at Northeast Missouri State University. Norton had two sons. Norton died on September 18, 2013, at a care facility in Las Vegas, Nevada from heart failure. He was 70 years old and had suffered a series of strokes in later life. ↑ Goldstein, Richard (September 18, 2013). "Ken Norton, a Championship Fighter Who Broke Ali's Jaw, Is Dead at 70". New York Times. ↑ "Ken Norton, heavyweight boxing legend, dies at 70". BBC. 19 September 2013. Retrieved 19 September 2013. This page was last changed on 20 June 2018, at 03:30.